Illegal Alien, hand painted shirt. The slogans are a selection of derogatory words regarding migrant workers that I have found in the media. These are words and slogans used on a daily basis in the media and that serve (whether intentionally or subconsciously) to undermine and otherwise derise individuals or groups of immigrants – civilians who do not belong to the countries’ native population. The models used in the foto-shoot are Ukrainian and Russian emigrants to UK. 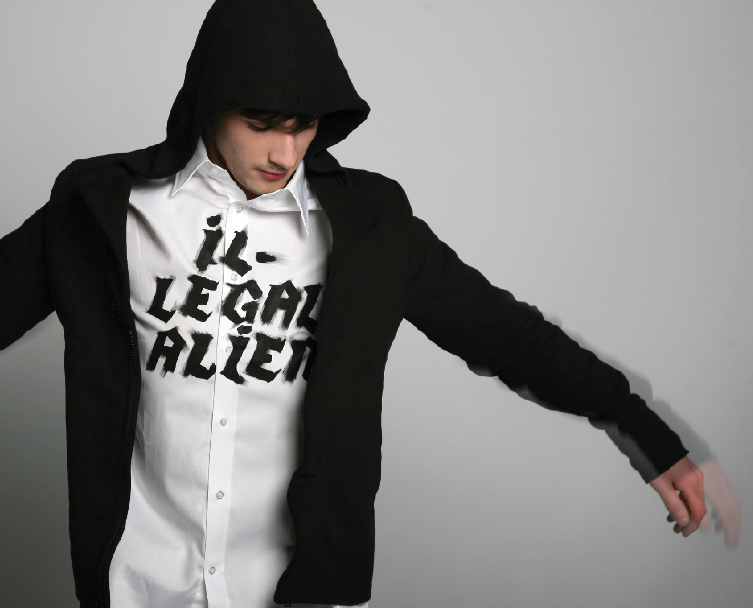 Aliens Ltd. is a series of mass-produced T-shirts, with the anti-immigrant slogants painted (by myself) onto the area of the chest. Alien Mother, hand painted shirt. Bloody Foreigner, hand painted shirt.